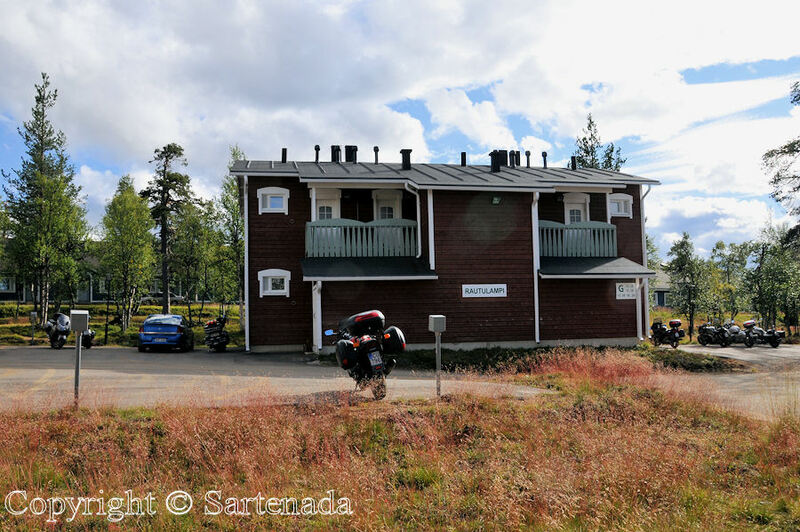 Now we have arrived to Saariselkä from Kirkenes. 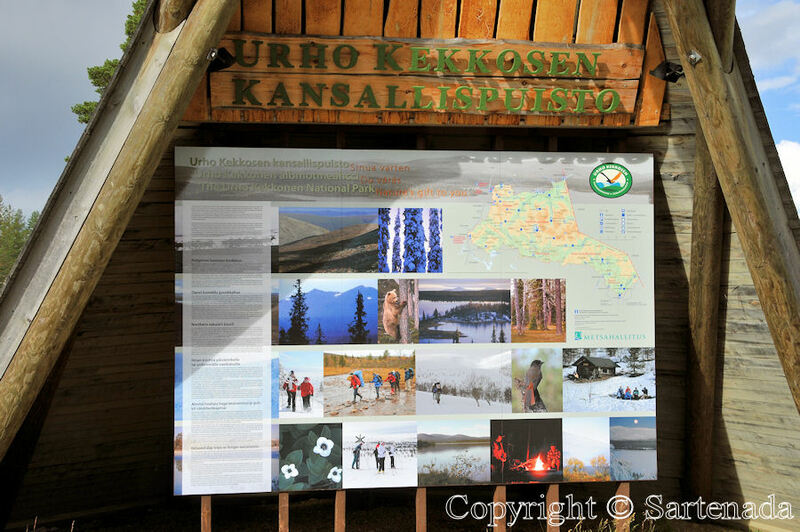 Saariselkä is a part of Urho Kekkonen (ex-president) National Park. 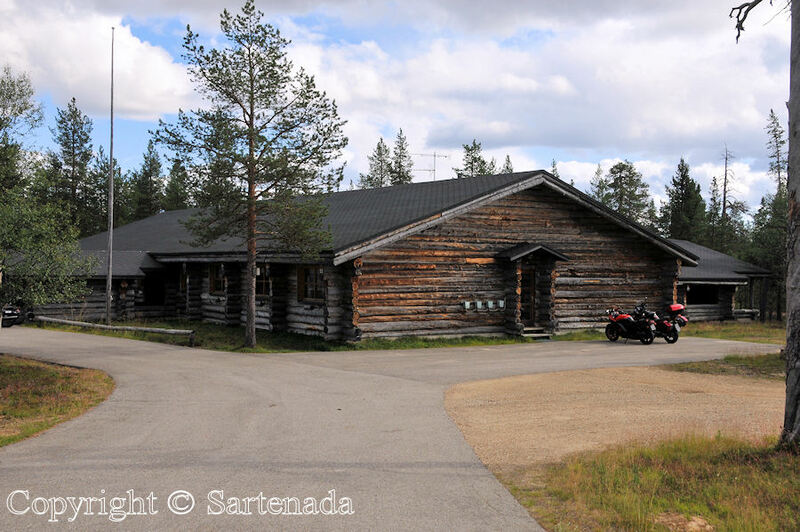 The area has hotels, log cabins, especially Kelo log cabins, good hiking and skiing possibilities. One can say with good heart that it offers for everyone everything. 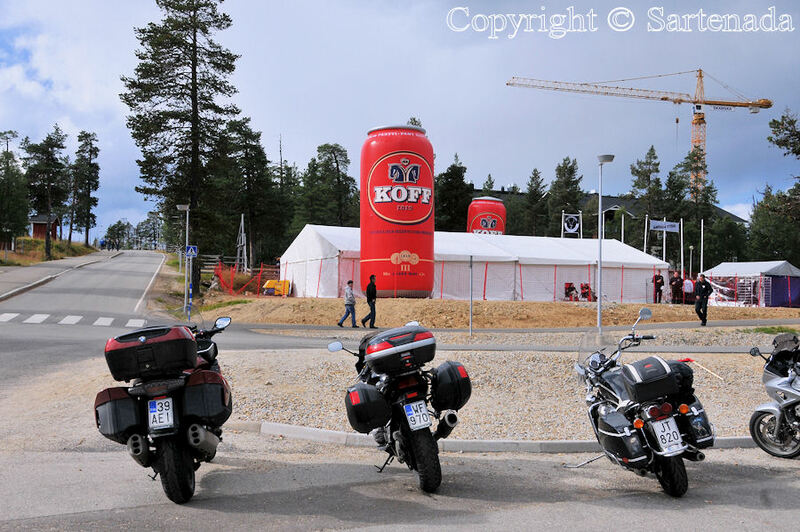 When we arrived there, we were surprised at the amount of motor cyclists. 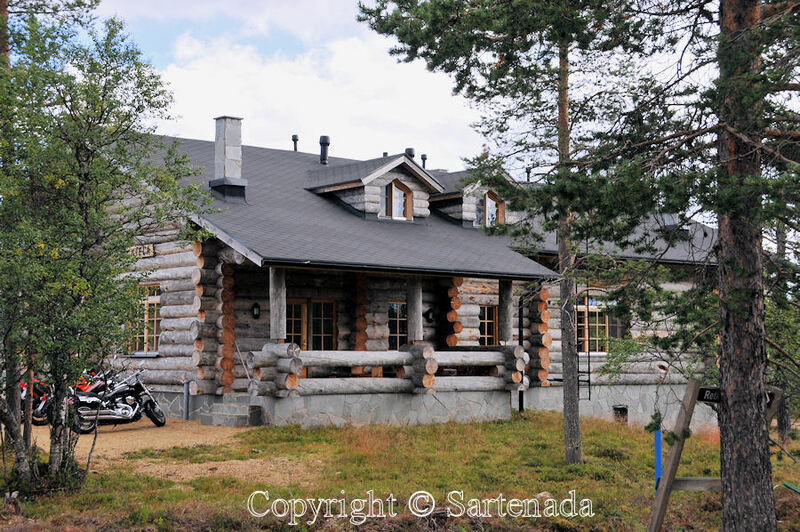 We went to central reservation office where the booking clerk told to us that this week-end there is a happening called in Finnish: “Jänkhällä jytisee.” It is in Finnish dialect and I try translating it into English “It is rumbling on wide swamp of Northern Finland”. When I heard it first time I did not understand the content. That was true, until I heard later that there were registered 2043 motor cyclists this week-end on the area! Imagine if 2043 motor cyclists start their engines ant same time, are there any rumbling? Well, those motor cyclists were behaving like real Gentlemen. After inserting the luggage into the apartment we rented, we walked around the area here and there. What we saw, That You see thru my photos. 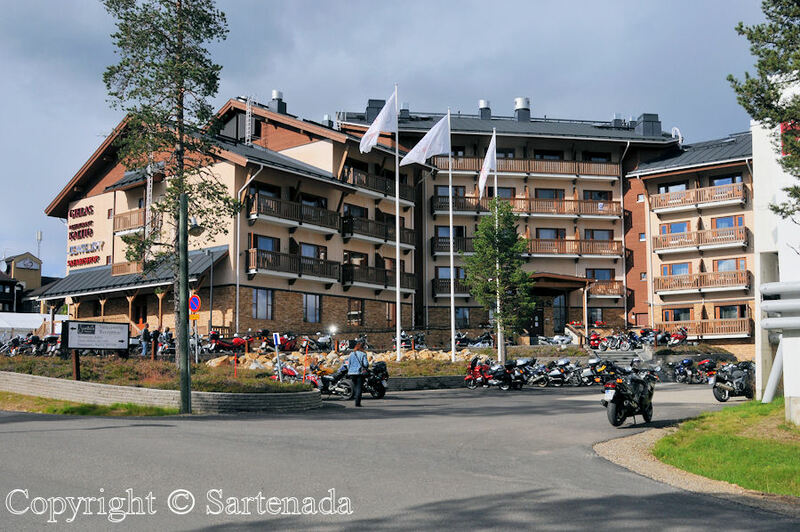 Third and second photos from the end are showing our apartment which is on the second floor above the huge motor cycle. 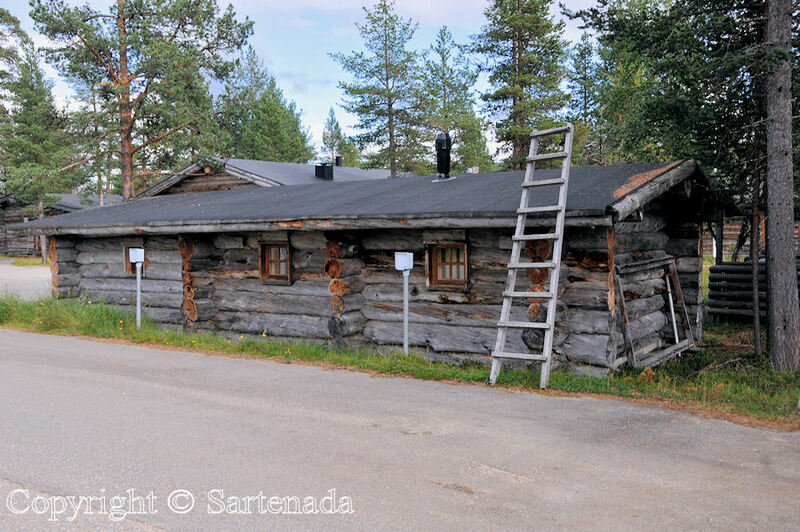 The small window You see is the window of our Sauna and a good Sauna that I can say after having bathed twice in it. 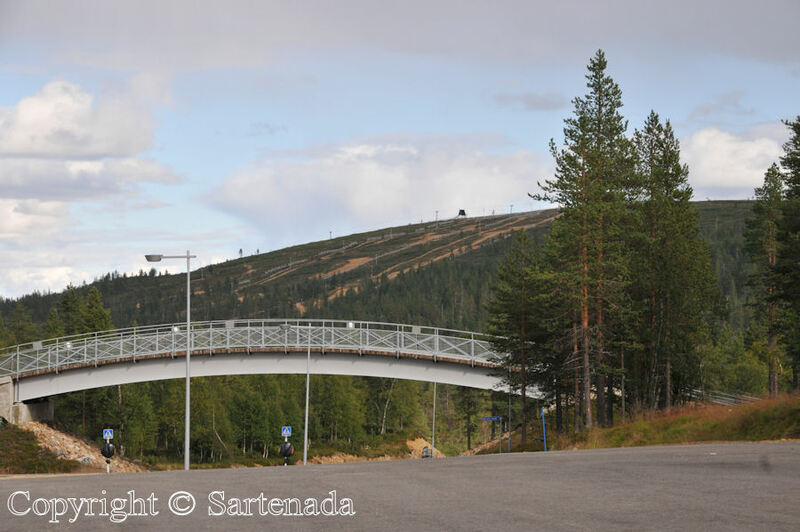 Ahora hemos llegado a Saariselkä desde Kirkenes. 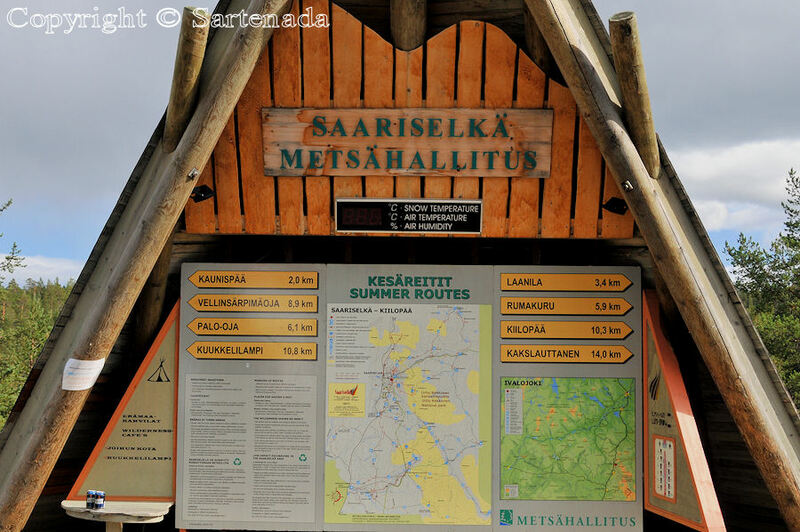 Saariselkä es una parte del Parque Nacional de Urho Kekkonen (ex presidente). 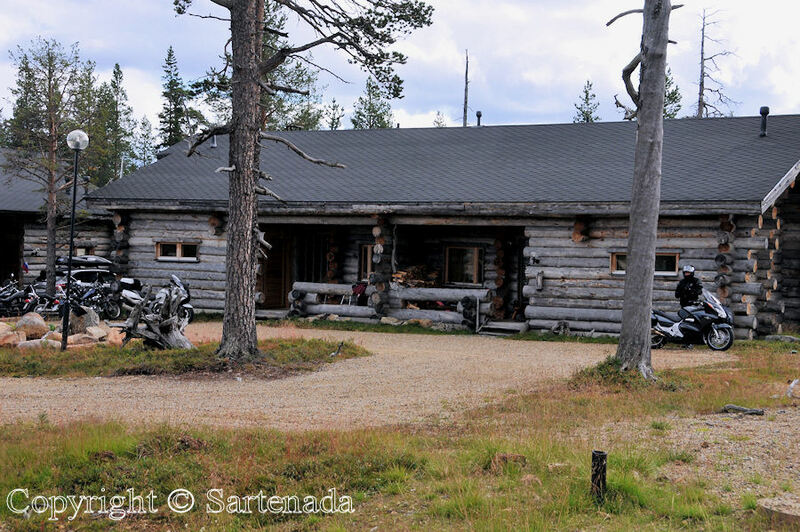 El area está lleño con hoteles, cabañas de madera, especialmente en cabañas de madera Kelo, buenas posibilidades de senderismo y posibilidades de esquí. Se puede decir con buen corazón que Saariselkä ofrece de todo a todos. 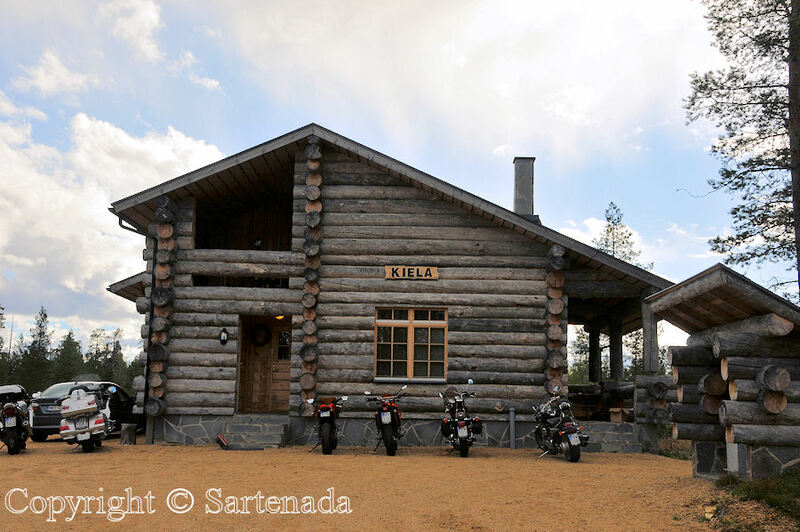 Cuando llegamos allí, sorprendiamos de la cantidad de motociclistas. Fuimos a la oficina central de reservas, donde la oficial de reserva que nos cuenta que este fin de semana hay un acontecimiento llamado en finés: “. 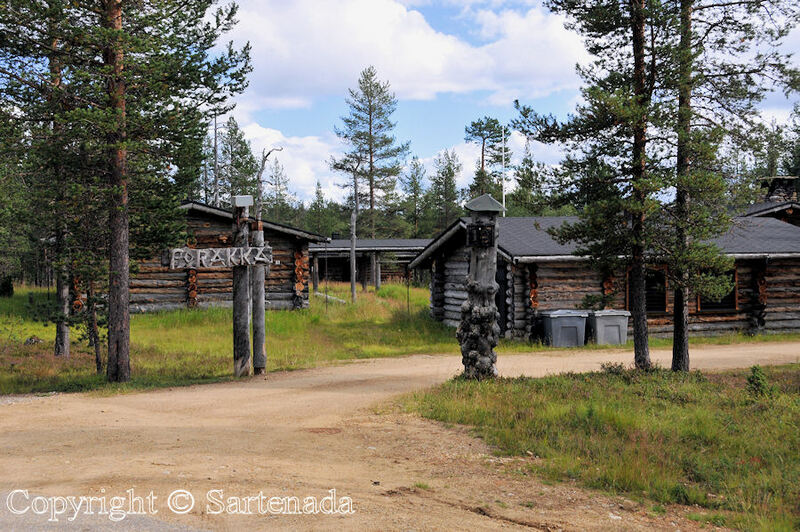 Jänkhällä jytisee” Es en el dialecto finés y trato de traducirlo en Inglés “Se está haciendo el retumbo en el pantano ancho del norte de Finlandia “. Cuando lo escuché por primera vez no entendía el contenido. Eso era verdad, hasta que escuché más tarde que se han registrando 2.043 motociclistas este fin de semana en el área! Imagíne si el número de 2043 motociclistas inicien al mismo tiempo sus motores, ¿hay algún retumbo? Pues, los motociclistas estaban comportando como verdaderos caballeros. Después de introducir nuestras equipajes en el apartamento que alquilamos, caminamos alrededor de la zona, aquí y allí. Lo que hemos visto, vieres a través de mis fotos. La tercera y segunda foto de la final están mostrando nuestro apartamento, que está en el segundo piso por encima de la grande motocicleta. 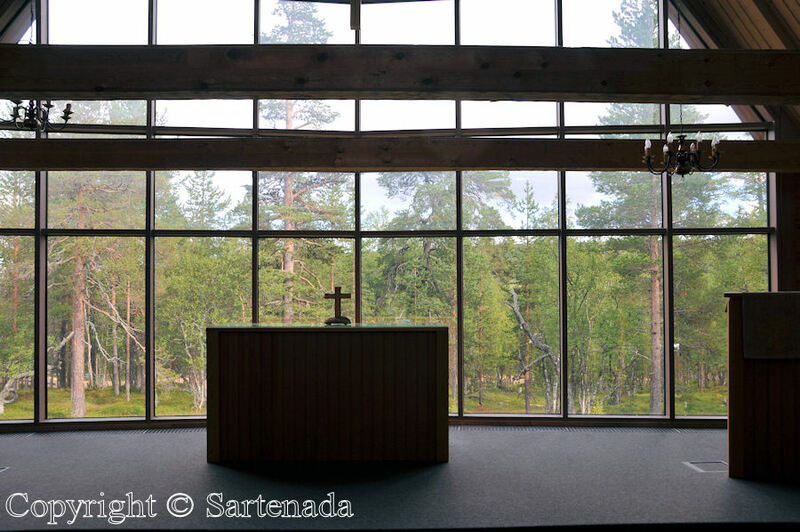 La pequeña ventana que se ve es la ventana de nuestra sauna y un sauna bueno lo que puedo decir después de haberse bañado dos veces en el mismo. 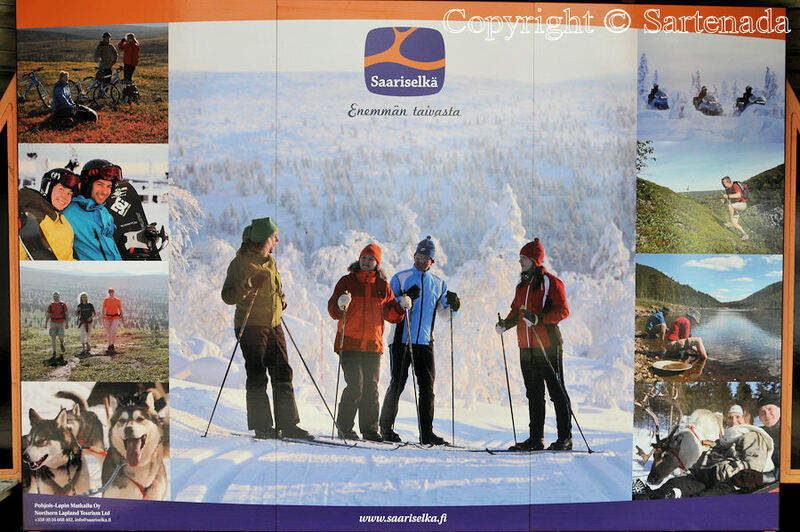 Maintenant nous sommes arrivés à Saariselkä de Kirkenes. 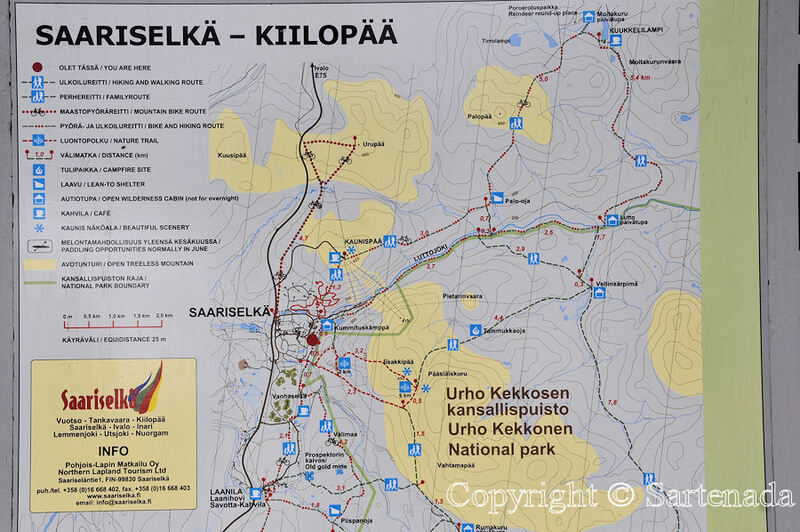 Saariselkä est une partie de Urho Kekkonen (ex-président) du parc national. 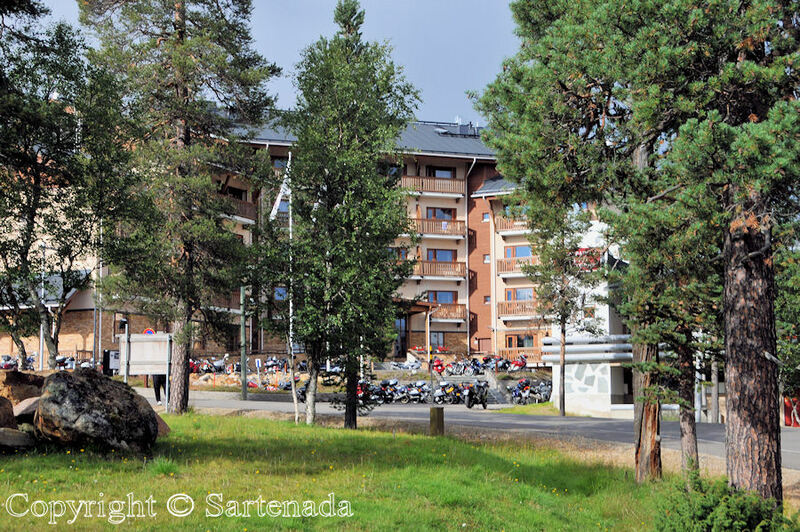 La région possède des hôtels, chalets, cabanes en rondins Kelo en particulier, la randonnée et de bonnes possibilités de ski. On peut dire avec bon cœur qu’il offre tout pour tout le monde. Quand nous sommes arrivés là, nous avons été surpris par l’énorme quantité de motocyclistes. Nous sommes allés au bureau central de réservation où la employée de réservation nous a dite que ce week-end il ya un évènement appelé en finnois: “. Jänkhällä jytisee” Il est en dialecte finlandais et je vais essayer de le traduire en anglais “Il gronde sur les marécages du Nord de la Finlande ». Quand je l’ai entendu la première fois je ne comprenais pas le contenu. 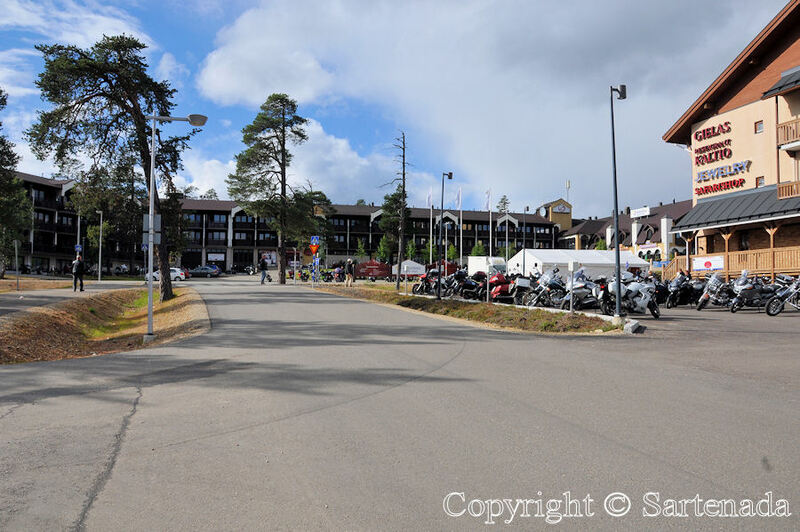 Cela était vrai jusqu’à ce que j’ai entendu plus tard, qu’il y avait enregistré 2043 motards ce week-end sur la région! 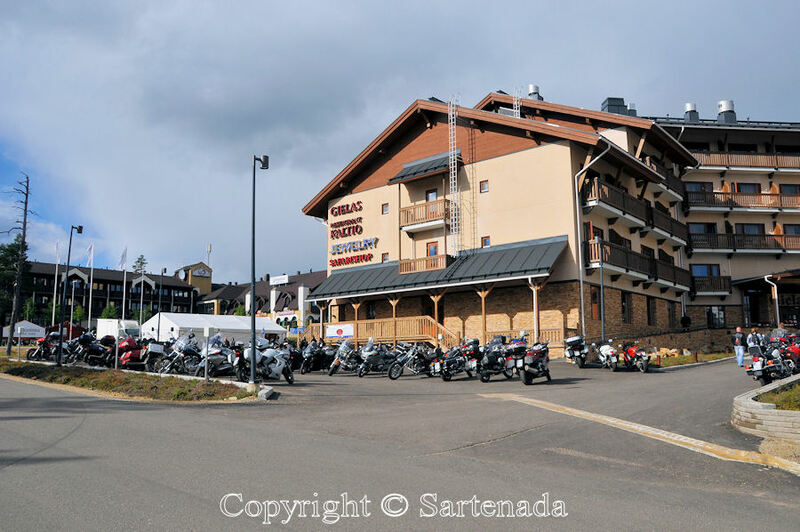 Imaginez si 2043 motards démarraren leur moteurs dans le même temps, il-y-t-il aucune rumble? Eh bien, ces motocyclistes se comportaient comme des vrais gentlemen. Après l’insertion des bagages dans l’appartement que nous avons loué, nous avons marché autour de la zone ici et là. Ce que nous avons vu, ça vous voyez à travers mes photos. Troisième et deuxième photo de la fin montrent á Vous notre appartement qui est au deuxième étage au-dessus d’énorme motocycle. La petite fenêtre que vous voyez est la fenêtre de notre sauna et c’est un sauna bien que je peux dire après avoir baigné deux fois en elle. Thank You. 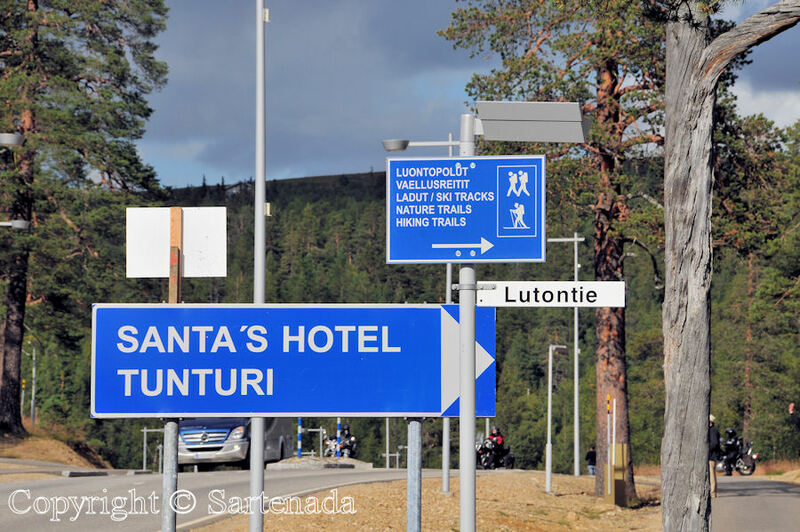 Finnish Lapland can offer “surprises”. Bon week-end á toi et bises. 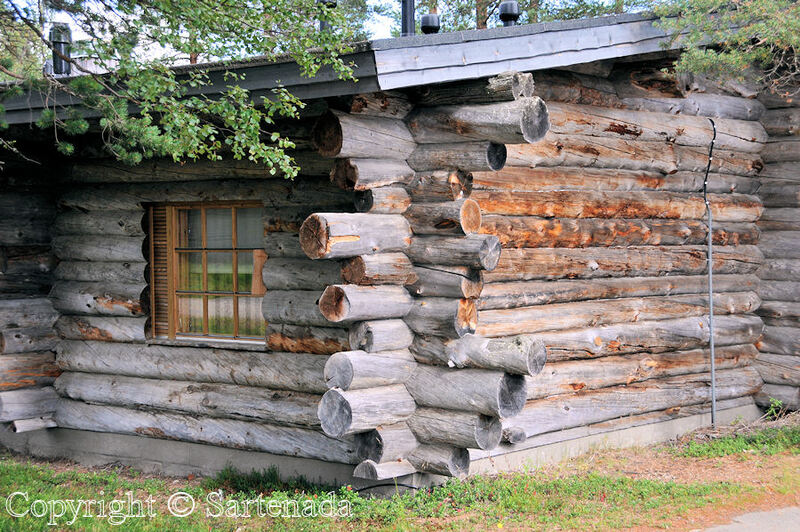 These houses of large logs are amazingly beautiful. 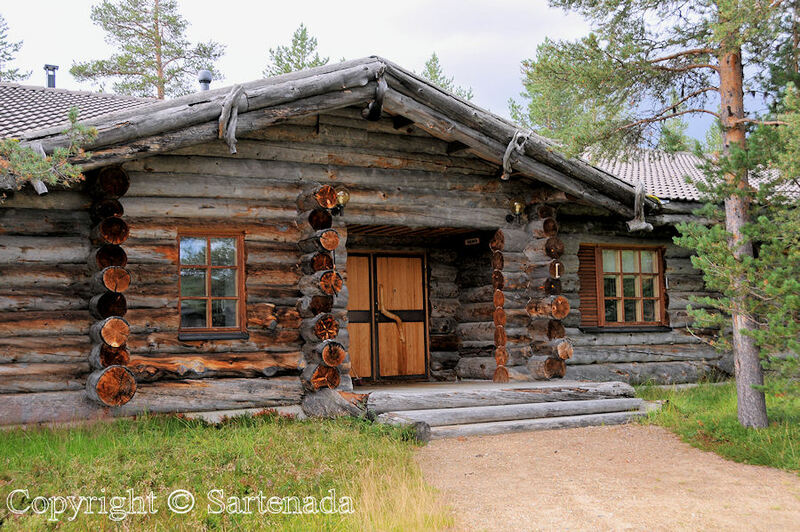 I am glad that You liked these Kelo log cabins. Well, as I told in preface these were behaving in a very good manner. It is true that they were drinking, but there was no harm. What cute cabins! I would love to stay there. Thank You for Your comment. Those log houses are equipped with all things one needs. 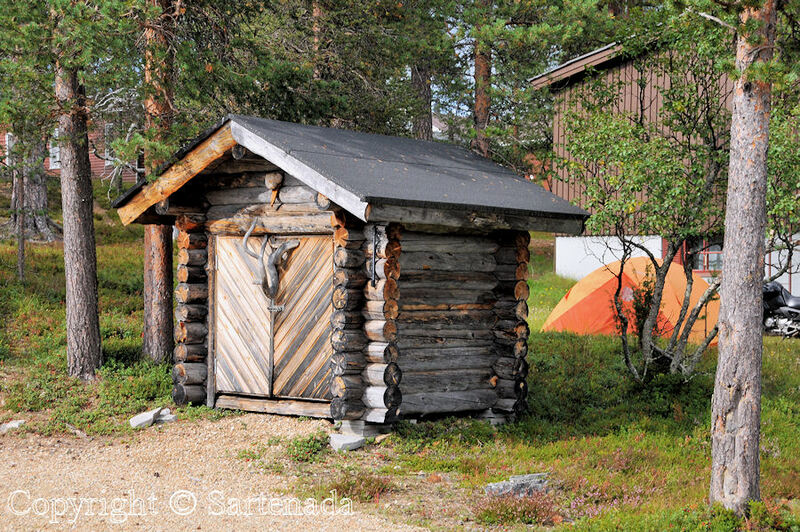 In Finland they have own Sauna, it is natural. So we had also, as I mentioned. 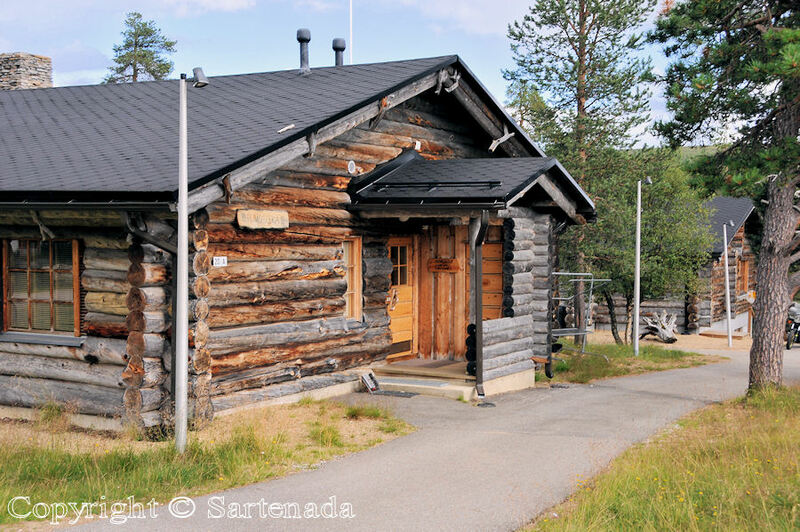 Everyone wants a cabin with Sauna and that is why they are common here. 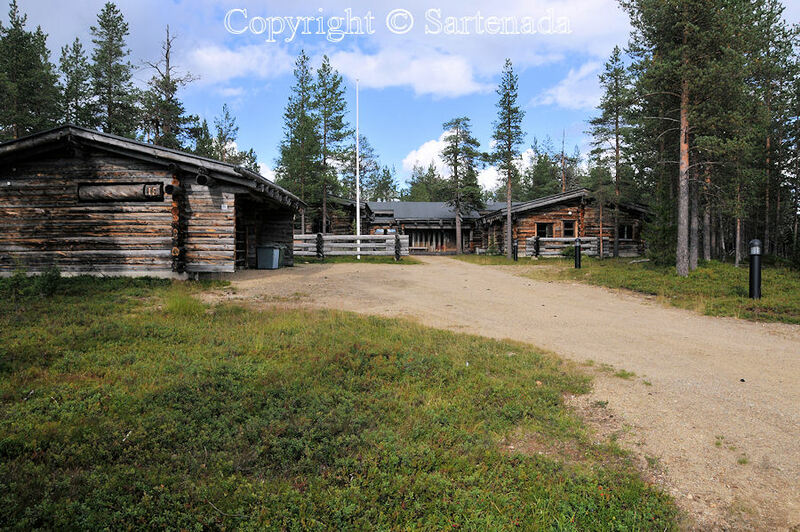 The cabins remind me of the lincoln log play toys when I was young. Beautiful country! Oh, that awesome memory. Thank You leaving Your comment. Thanks for these photos. It gives us an idea of what it’s like there. Very unique. Thank You stopping by and leaving Your comment. Blogs are great way to see our world thru co-bloggers photos. 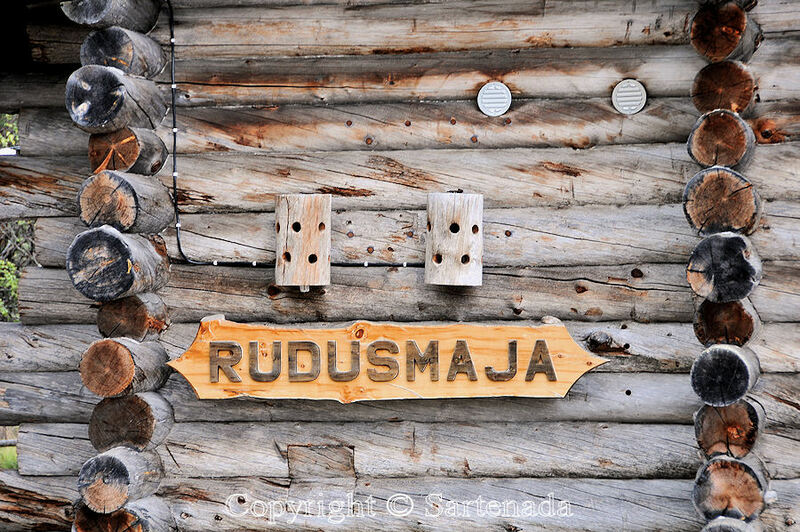 Thank you for sharing this beautiful, rustic area with us. 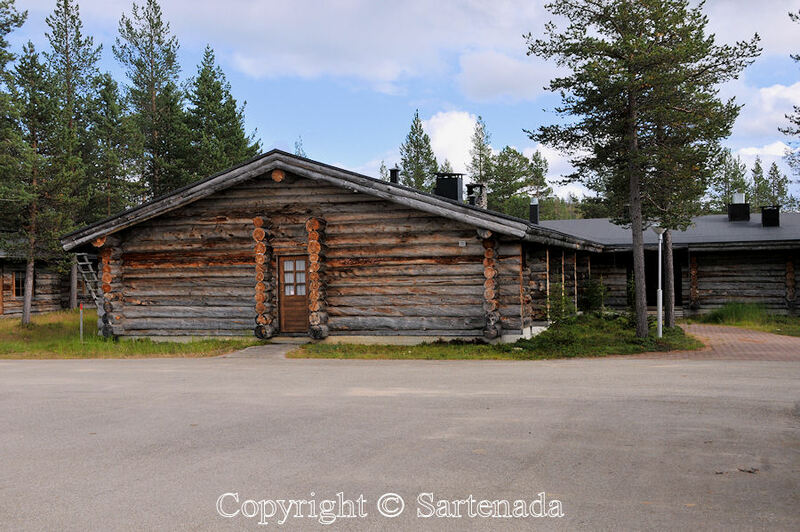 I really like the log cabins. In the last photo it looks as if you are thinking it would be nice to have a motorcycle! I used to live near Myrtle Beach, South Carolina. 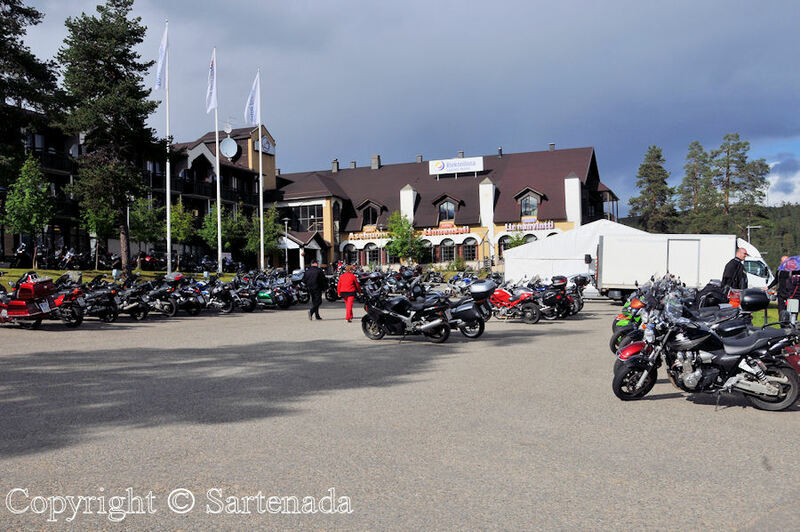 Every Spring 10,000 or more motorcyclists would hold a week-long rally there. We could hear the ‘rumble’ well into the night during that time. 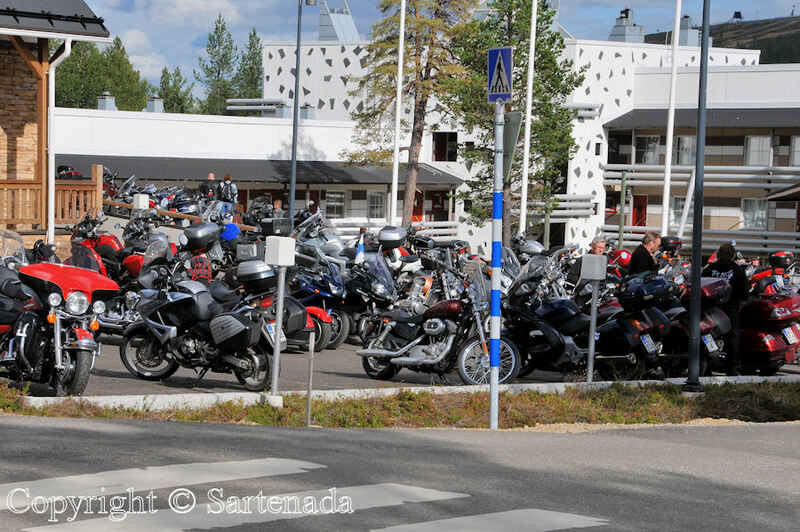 OMG 10000 motorcyclists. 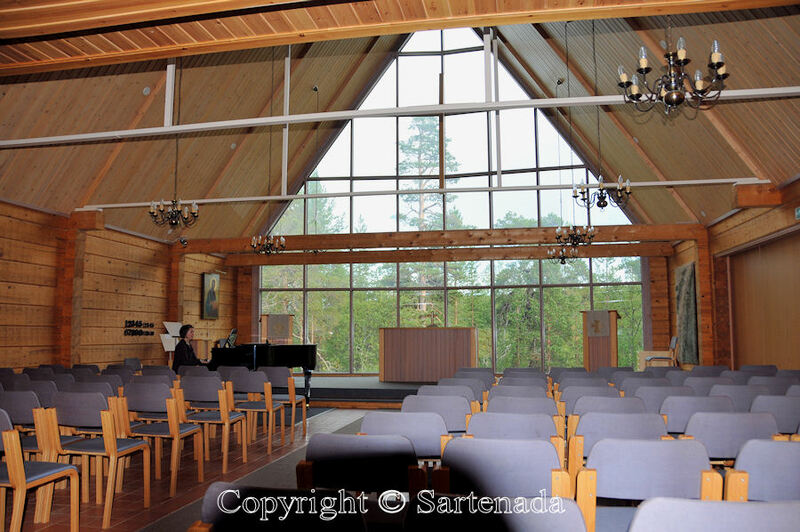 To us this was an experience “once a life”, because we are living on very silent area surrounding by pine trees. Well, when I was young I had a moped, not motorcycle. 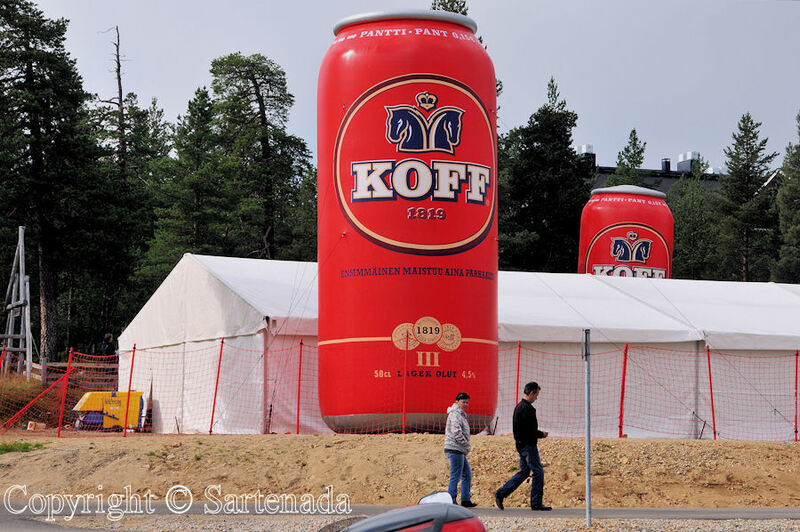 I drove with it around in Finland. Motorcycles are dangerous anyway and I am not dreaming from them. Thank You for Your comment. 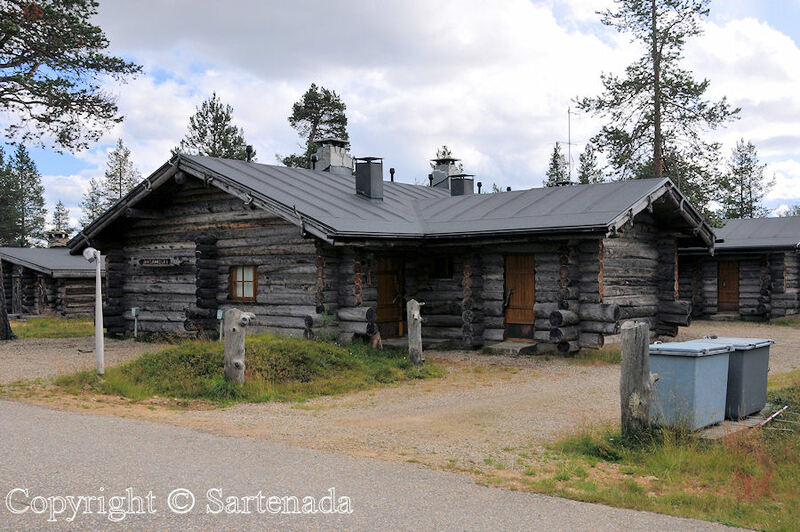 I am very happy that You did find these log cabins interesting. Thank You for Your comment. 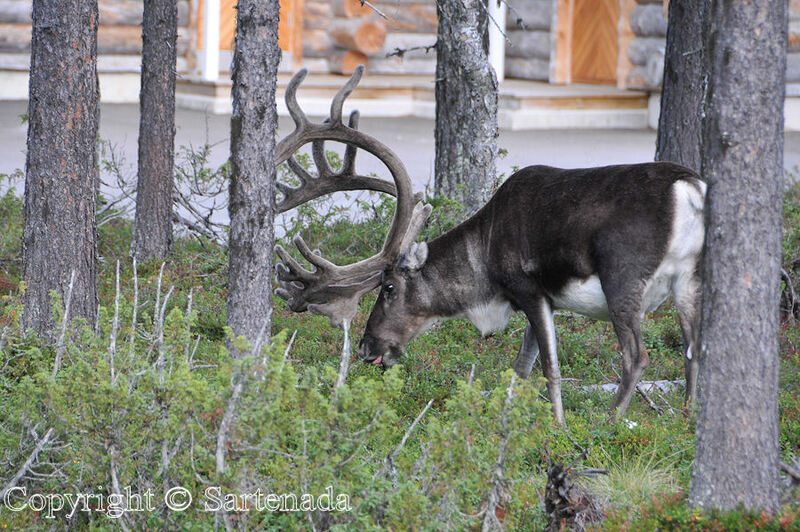 I love the reindeer, they were so beautiful. 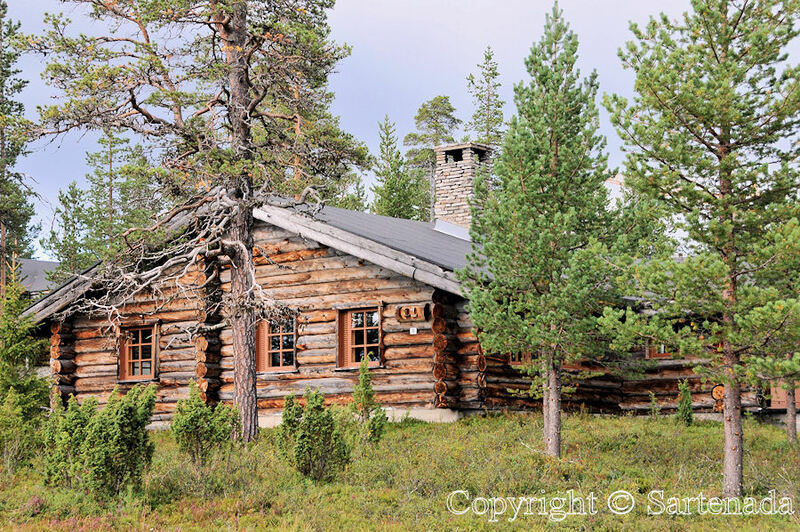 And those log cabin homes were amazing! So nice to read that You love reindeers. After two weeks there will be awesome photos from them in a hotel area among cars. They are cute. Thank You for Your visit and comment. I cannot imagine the rumbling of that many motorcycles! 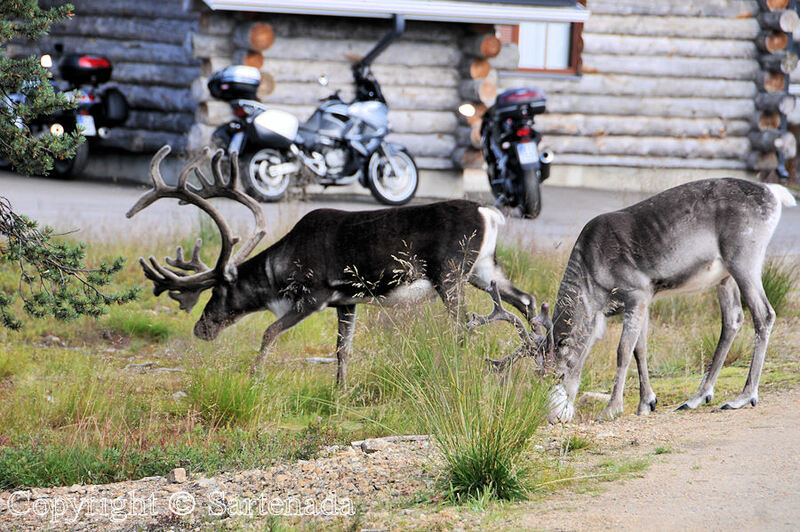 I especially like the picture of the reindeer with the motorcycles in the background – great contrast of subjects. 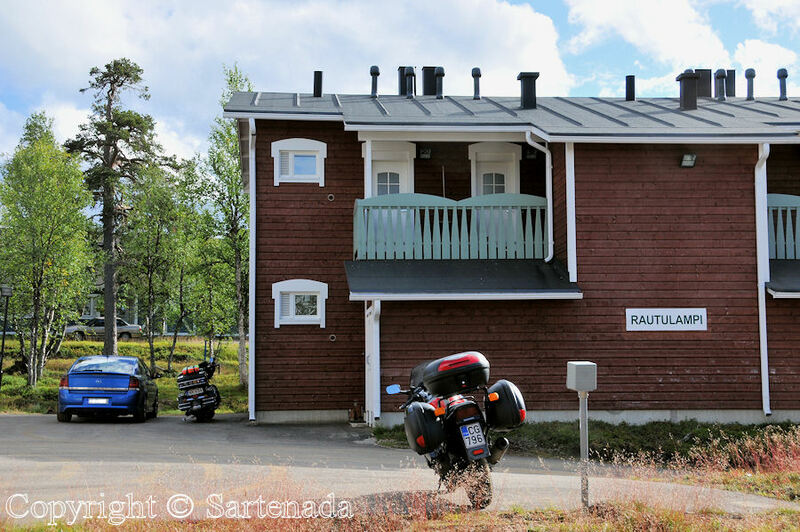 You look like you are ready to hop on the motorcycle – would you trade your sweet little blue car for the chance to ride the bike north of the arctic circle? Well, the sound was “terrific”, but it was not all the time. It was nice to listen to it, then when many started to drive to the top of nearby hill to which we also walked next day. Yes, I am ready to test drive some motorcycle, but I am not ready to trade my blue car. I am so glad that You left Your comment here. Such a charming location! It really looks like there were lots of people there. Still, it’s very lovely! 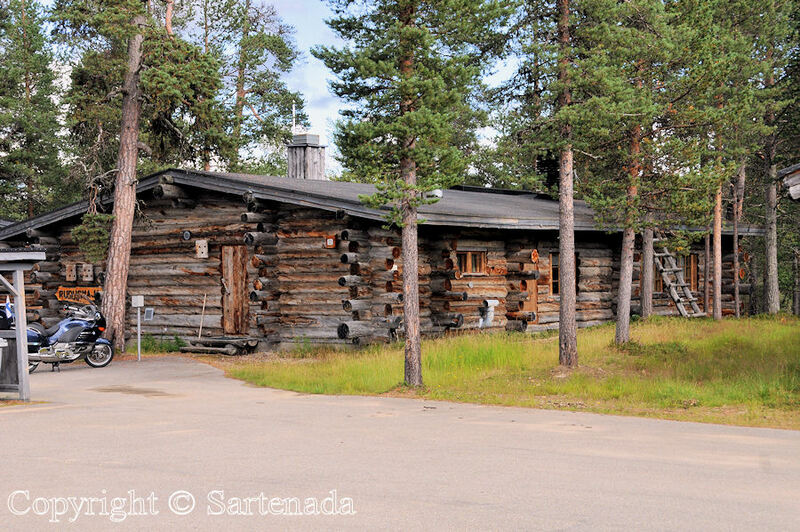 Yes indeed there were a lot of people, but who were “hidden” among their own log cabins. That’s maybe after driving for long time and way, so they were tired. It was very nice that You left Your comment here. 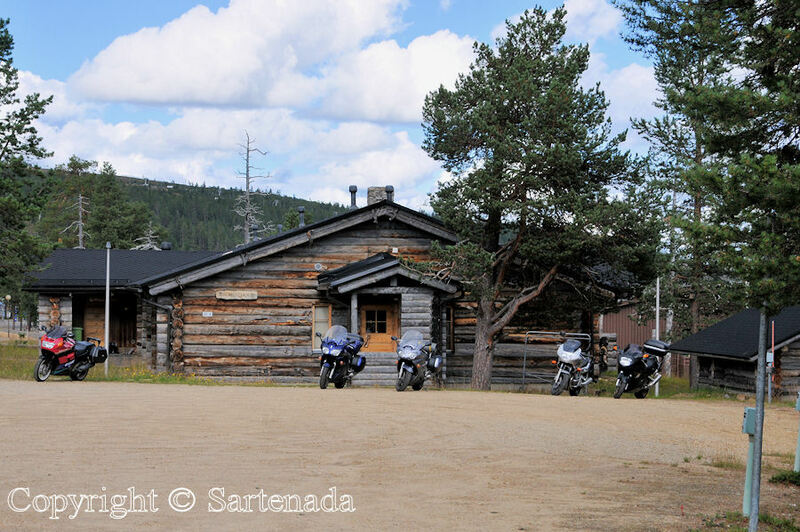 Riding a motorcycle that far north is an intriguing thought! I ride a Gold Wing myself, but must be careful at times: they do not do well in snow and at temperatures around freezing riding is not too pleasant. I love seeing the log construction of all the buildings. I wish I could have visited there when those buildings were new to see what i was like in those days. They look very sturdy and warm! Here motorcycle period is from April to mid October approximately. 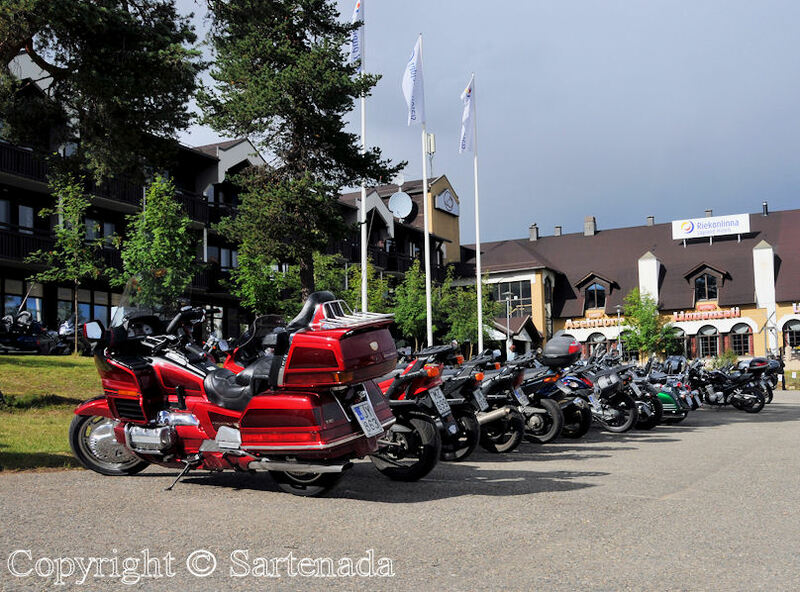 We have also in Finland Gold Wing club with members 795. It was established in 1993. 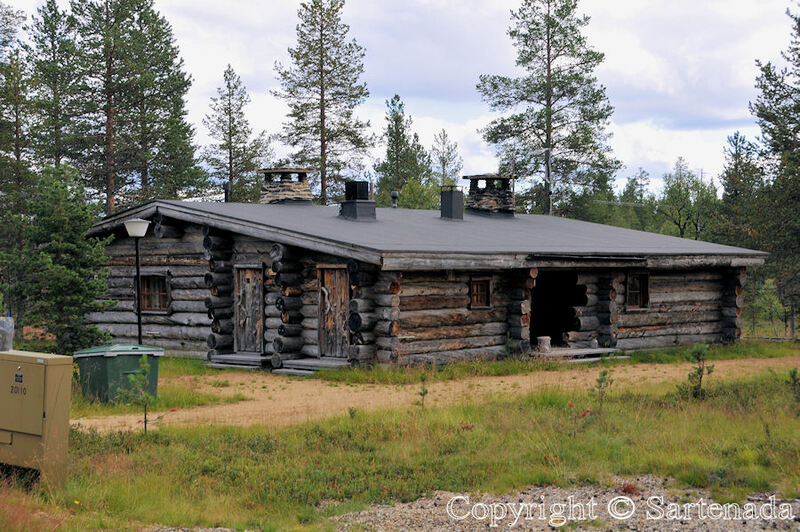 Those Kelo round log houses are sturdy and warm, because people can use them in winter. I am very glad that You made Your comment. Happy Monday! BTW, I have still my late father’s moped at my countryside home. My moped was burnt in a fire, but my father’s was saved. The architecture of these houses is very interesting. 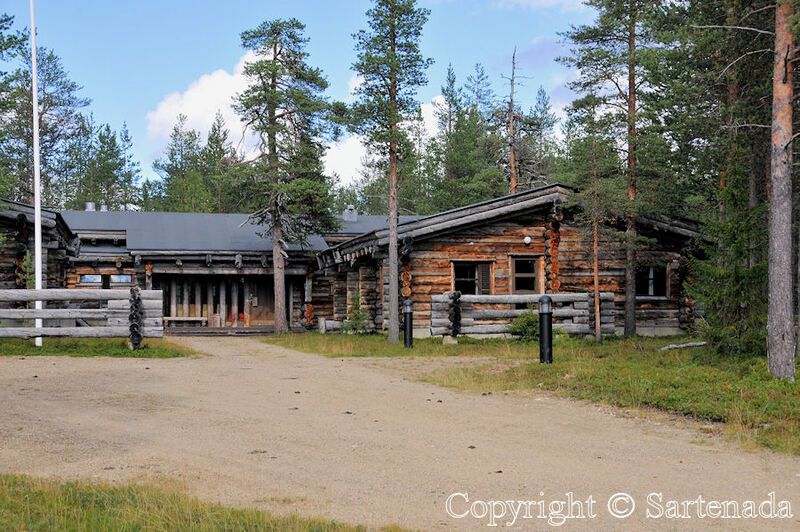 I am glad that You liked the architecture of these Kelo log houses. 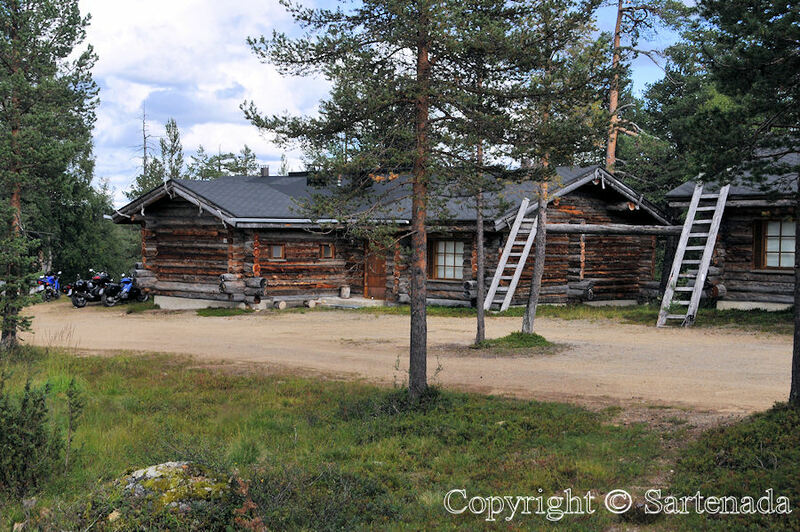 Kelo is a Finnish term for old, arctic pine trees or naturally circular trunks which are dead on site on upright position in Lapland. 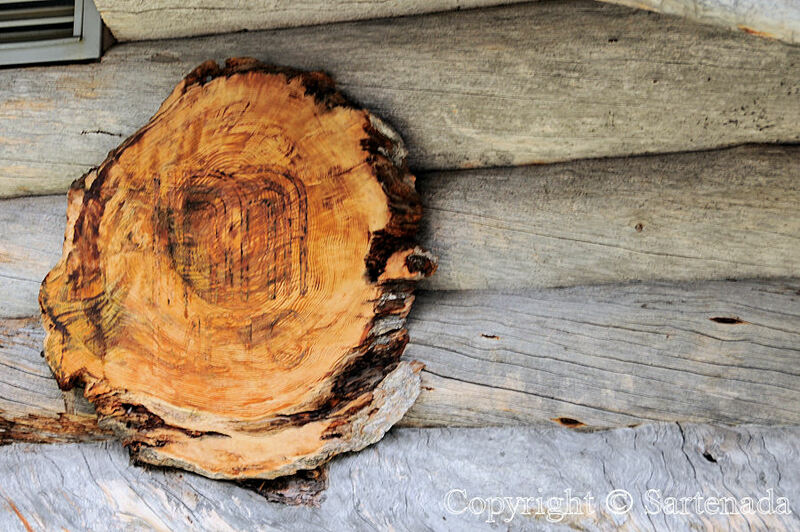 Later I show photos from Kelo logs in the nature. Thank You leaving Your comment. I love how you can tell how big and how many rooms are in a cabin just by looking at the logs that stick out. Why are there so many ladders. Love the post. I would love to stay there. Thank You for Your comment. I think that during winter man has to shovel snow away from roofs. Sometimes people have to shovel snow from roofs here in Southern areas too. For example last winter we had nearly one meter / 3.2 feet snow. The amount (height) is nothing, but if it is wet (water contained), then its weight is multiplied. 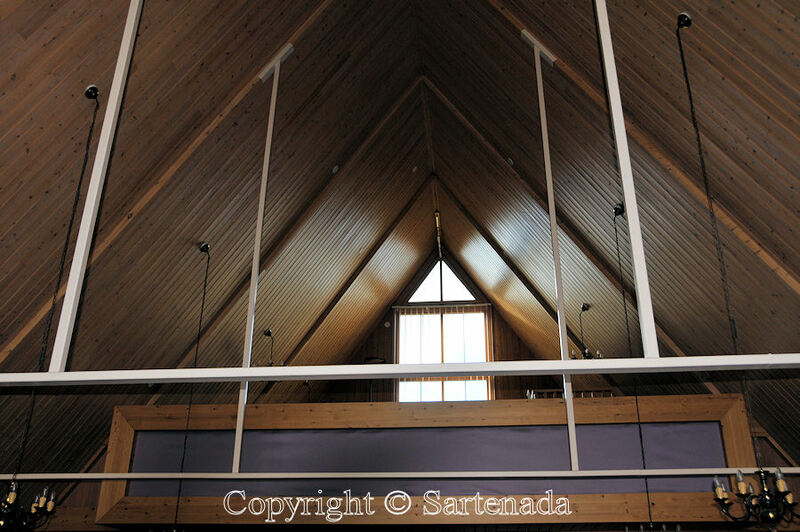 BTW, in other types of houses we have heavy fire regulations and that is why there are ladders here and there. Wow, that is very interesting about the ladders. I think it is very wise. But unfortunately here in the USA they tell us not to have ladders out because it makes it easier for people to break into our houses. Sad isn’t it. OMG, I never could not thought that what You told. For example when I was kid, at those days owners houses on countryside did not lock their houses, not even then when they were off. Now times have changed, but generally speaking we trust people here. Hmm, perhaps we are too naive! Thank You for Your comment concerning ladders. How glad I am that You liked the area. 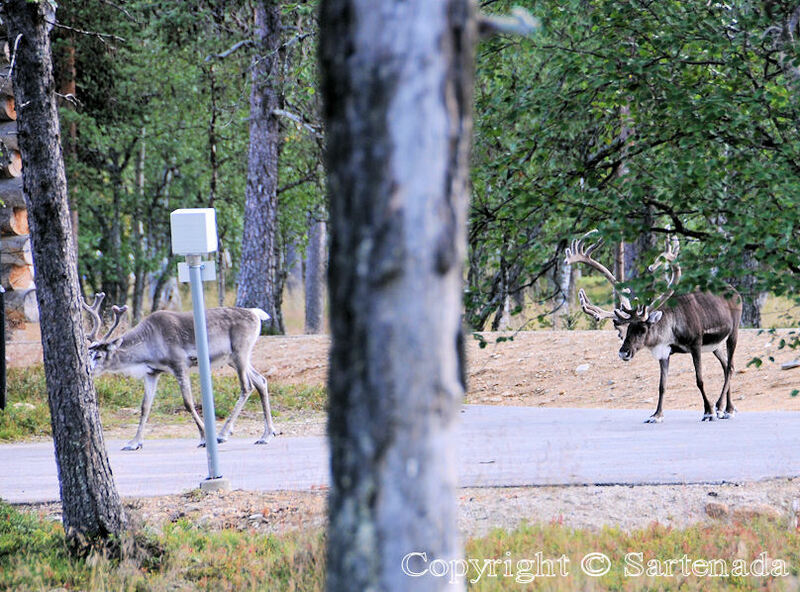 Reindeers are so friendly but a little “shy”. 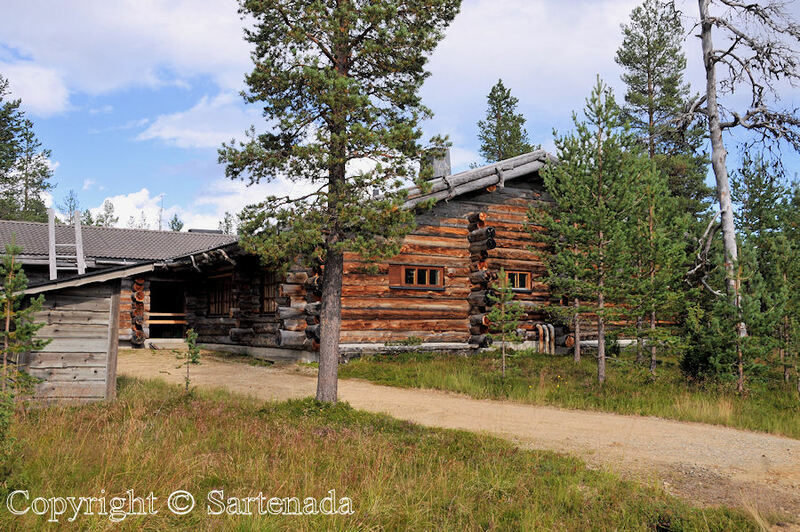 Bonitas casas de madera y sensacional reportaje de la serie del circulo polar. Me gusta tu comentario muchísimo. Muchas gracias al visitarte aqui. What a lovely place to be. 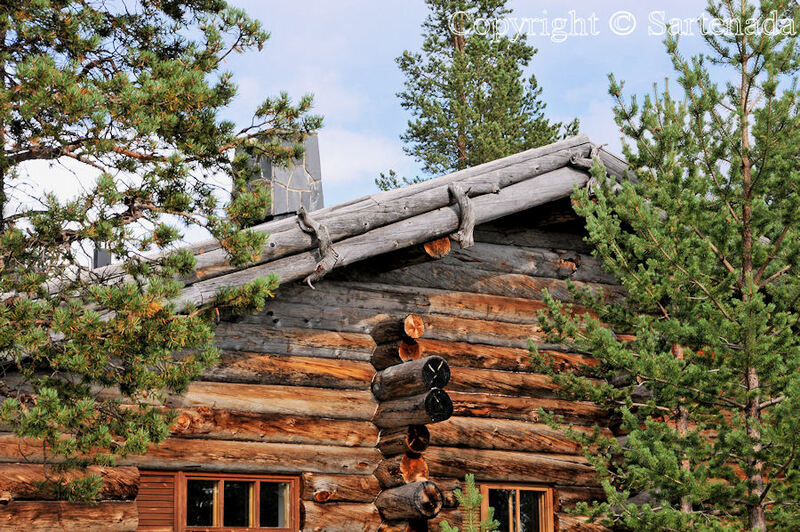 The log cabins are so charming. Thank You for Your visit and leaving Your comment. 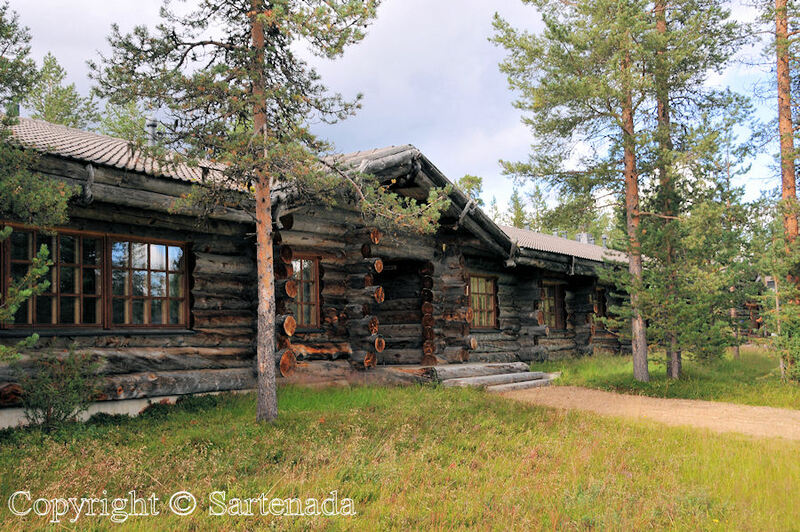 We love also those log cabins which are quite common in the Northern part of Finland. 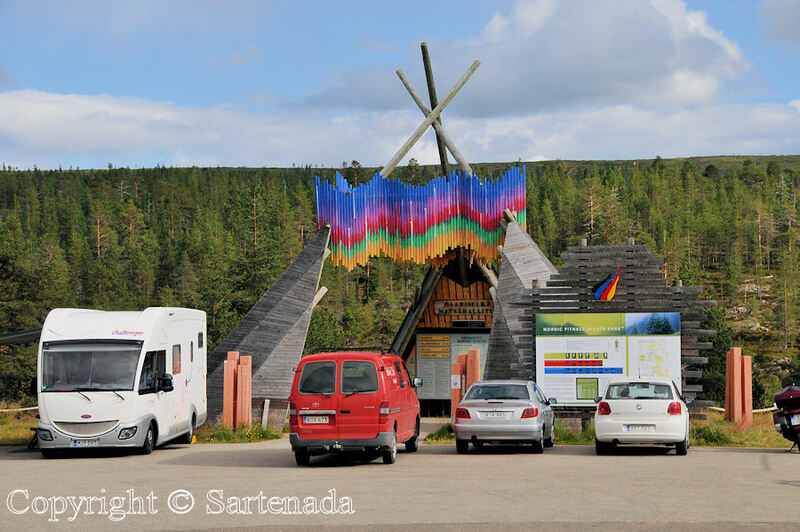 On many camping sites they are really popular. Having read Marion B’s comment, I can see the humour in the situation too – all that wilderness away from the city, only to find yourself surrounded by the ‘rumbling’! Having said that, in the last photo you look like perhaps you would like to swap your car for a ride on the motor bike! You made great observations, I love them. I was wondering in that photo in which I admired the big motorcycle, that how many seconds it takes to speed up from zero to 100 km / 62 miles. With my car it takes 6.3 seconds. 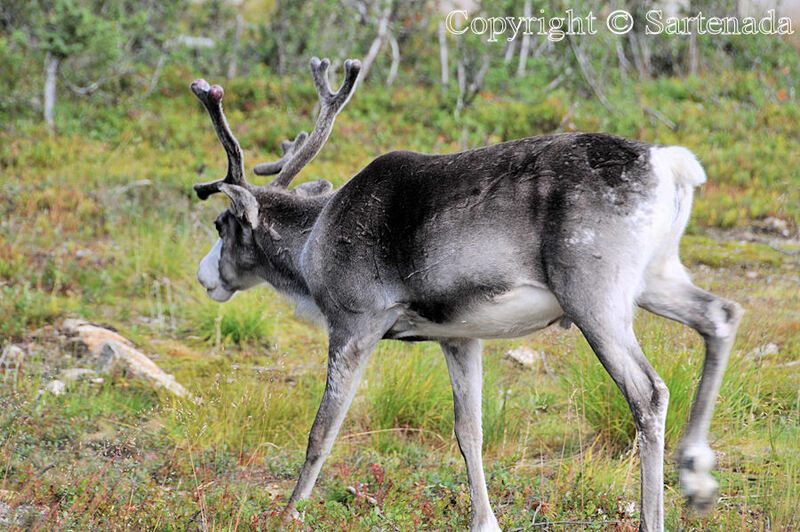 There will be more reindeers in the post which I’ll publish on Friday this week. Thank You commenting. Its nice to take a vacation to a ski town. I find that people are very friendly there. 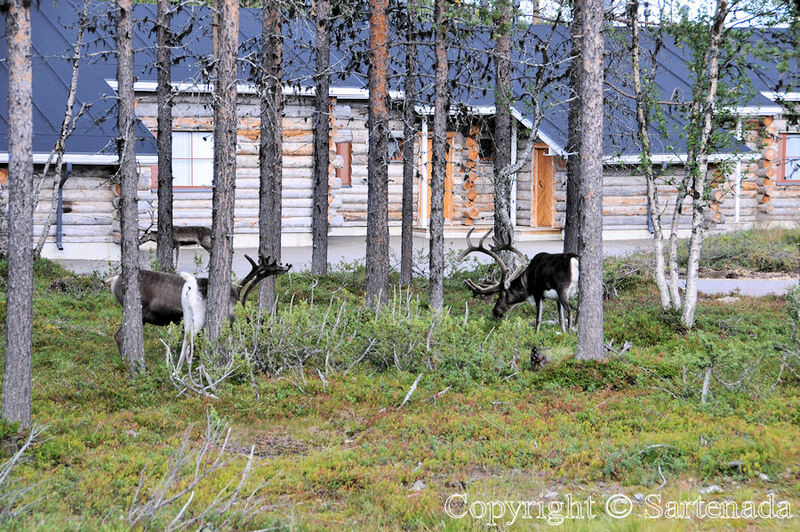 the deer and stay in cabin…its all fun! I am glad that You find it so. 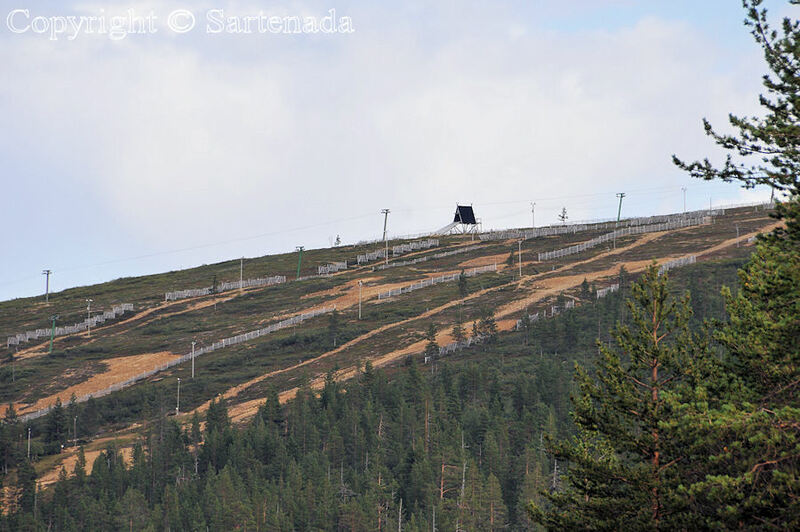 Skiing centers in summer can be nice places for a visit. Yes, I can very well imagine the deafening noise from more than two-thousand motorcycles all around. Enormous, gigantic mosquitoes come to mind! Hahaha. 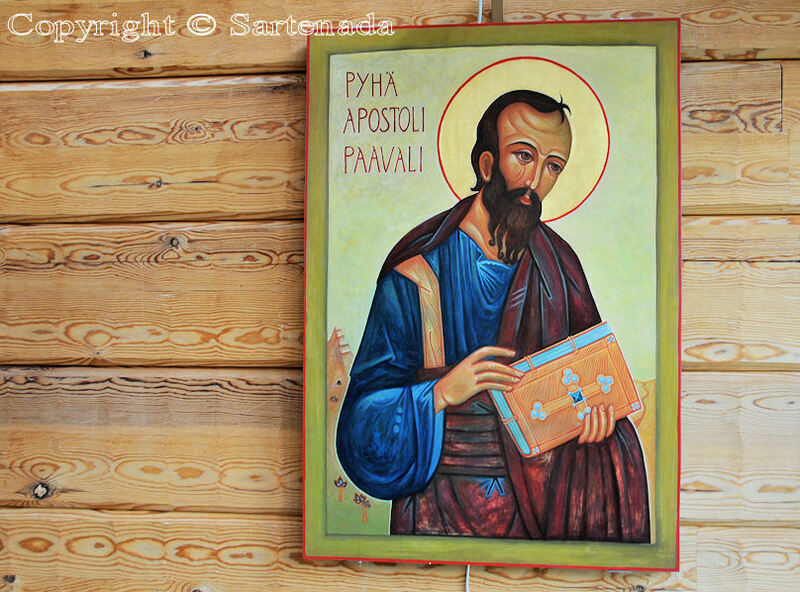 St. Paul’s icon in the church… interdenominational, I take it… is gorgeous. It reminded me of the ones I saw yesterday. Our friend, Mary Ellen, has painstakingly created very beautiful ones, the latest being that of St. Joseph. 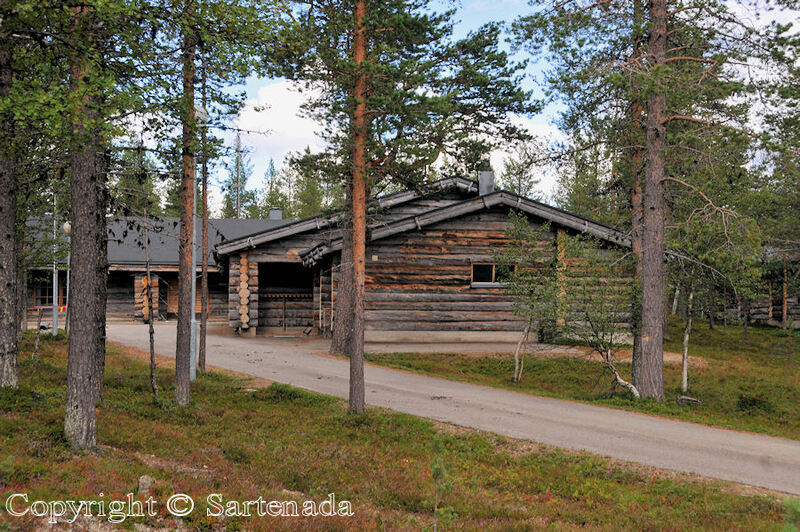 Your photos are as wonderful as ever, Matti! So real that I feel I’m there. Looks like a great trip! So many amazing pictures! Thank You for Your visit and comment. It was indeed. 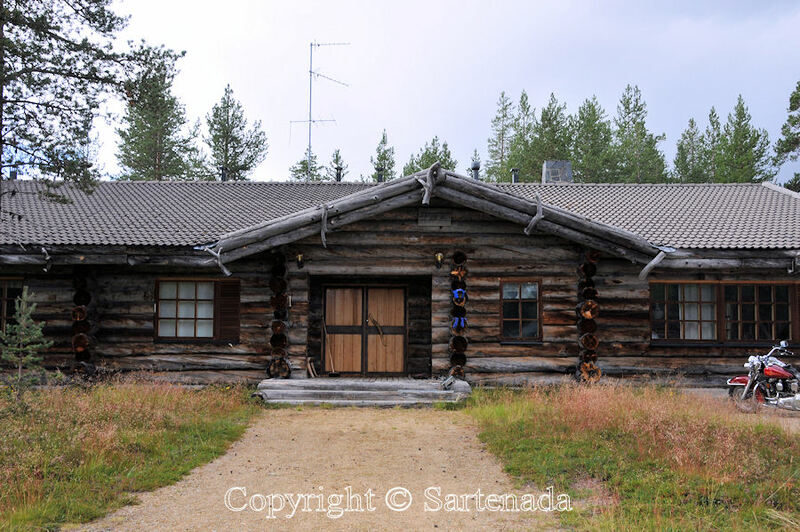 Last post from this series will be next Friday and then it time to say good bye to Arctic Circle. 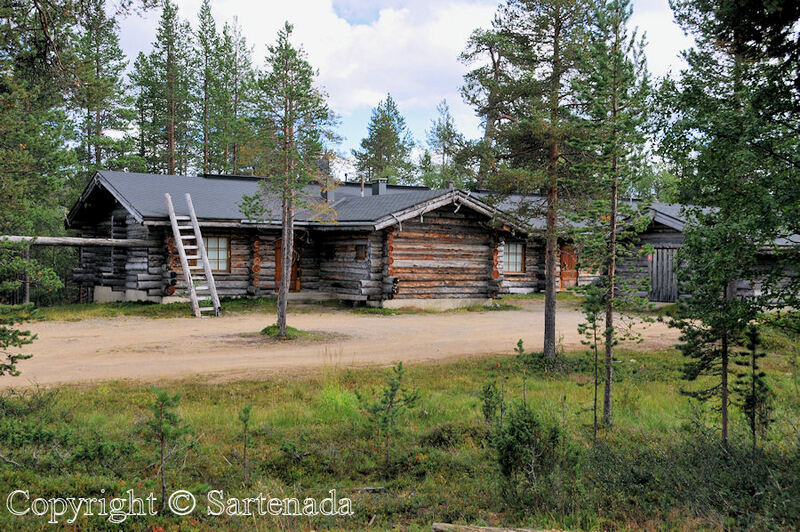 this place is one of my favorite places in Finland when on travel in the North. Thank You for Your comment. 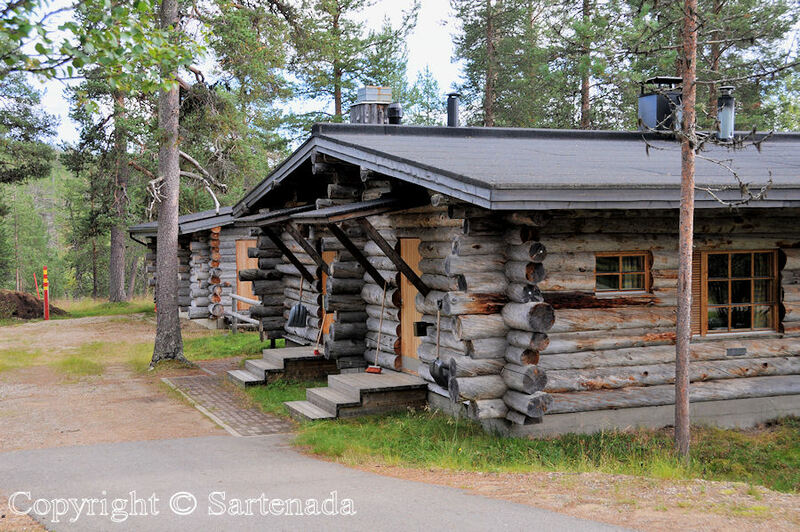 These log cabins look very sturdy and cosy. I can’t even begin to imagine what all those motor bikes would sound like it they were running at the same time. Amazing! Guess what. At first we thought that “Om my god”, but after settled down no noise, no disturbs. 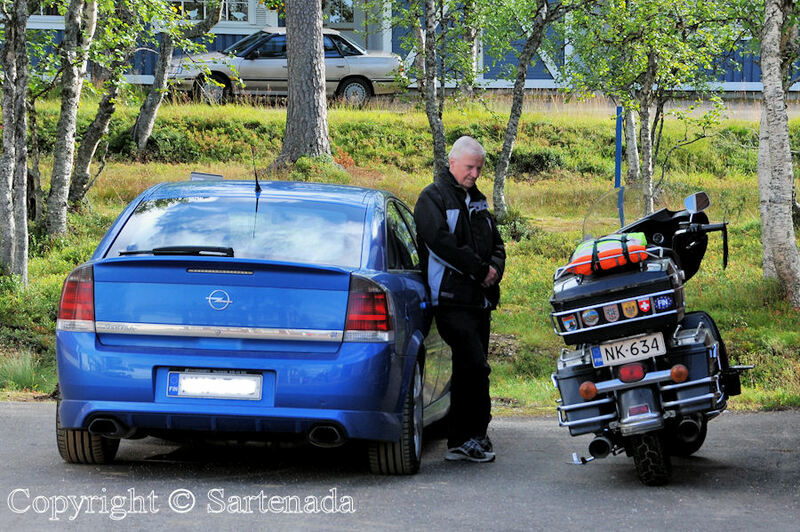 Before leaving the area, police checked their driving condition! Thank You. Your pictures are fantastic and the atmosphere is absolutely relaxing. Muchisimas gracias por tu amabilísima oferta. Cuando vaya estaria encantada de seguir vuestros consejos. Por supuesto Laponia es muy atractiva, pero creo que demasiado frio para mi. 😣 aunque no descarto nada, me encantan las sensaciones que no conozco. Esa sería una de ellas. 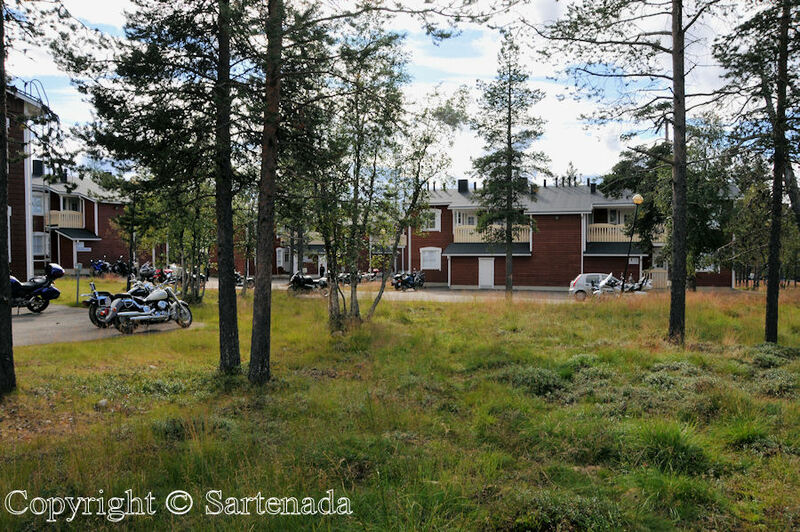 Nuorgam, el pueblo más septentrional de Finlandia y de la Unión Europea. Frío, pero la ropa ayuda. Gracias por toda la información Matti. La temperatura entre 15 y 25 está bien. Seguramente tengo que incluir esa opción en mi ruta de viajes. 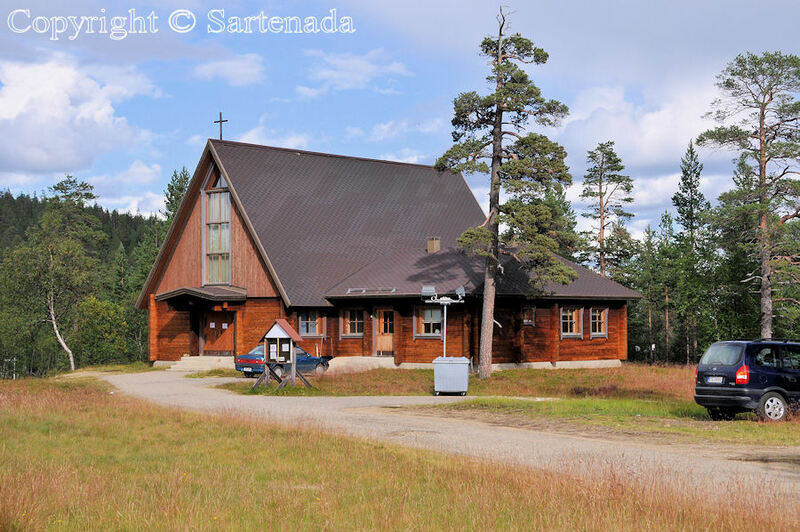 I remember visiting the church. Of course it all looks very different blanketed in snow. You are right Marion. Glad that You checked this post. 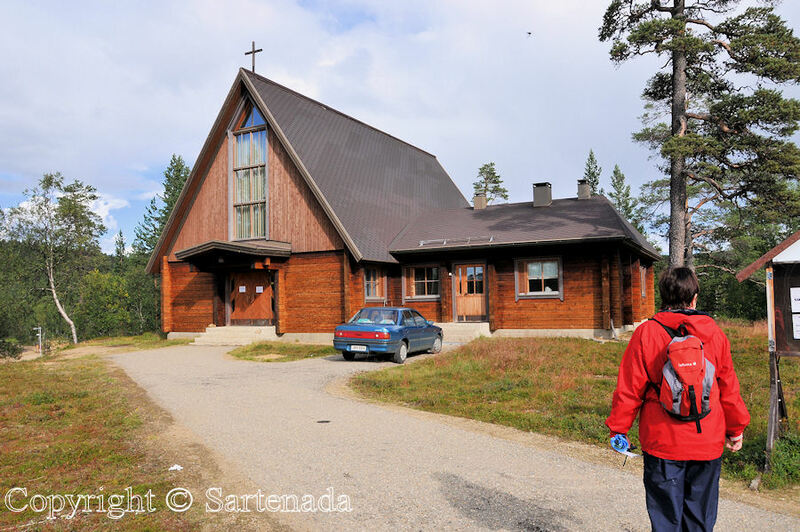 In the north there not so many churches, so it was must to visit.